Chesapeake AED Services is happy to release its second episode of their series entitled “Chesapeake AED Services” Mythbusters. 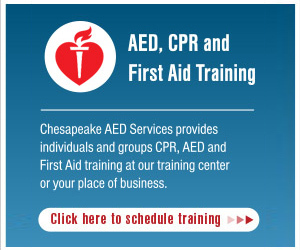 In this video Jon from Chesapeake AED Services debunks the myth that “An AED will shock someone by accident”. Click on the link above and tell us what you think. Grand Opening for our Brand New Web Store!